The San José-Tegucigalpa Accord: No to the Imperialist Edict! No to the Imperialist Edict! Fight for a Workers and Peasants Government! 1. The San José-Tegucigalpa Accord, supposedly the result of the Guaymuras Dialogue (after the original Spanish name for Honduras) between representatives of Honduran president Manuel Zelaya and the puppet “president” of the coup regime, Roberto Micheletti, is actually an imperialist diktat. It came about as a result of the arrival in the Central American country of U.S. Assistant Secretary for State for Latin American Affairs Thomas Shannon, and was signed under the watchful gaze of Shannon and the U.S. ambassador, Cuban gusano (reactionary exile) Hugo Llorens. This agreement does not mean the restoration of “constitutional order,” and even less does it represent a victory for “democracy”; rather, it is a victory for the blood-soaked coup plotters. 2. Shannon is the same sinister official who met with Micheletti, General Romeo Vásquez y Valásquez and the rest of the conspirators during the week before June 28 when they were preparing their coup d’état. At that time, speaking for Hillary Clinton, the godmother of the putsch, he counseled the plotters on how to get rid of the democratically elected president by “legal” means. Now he is advising them to accept an empty “restoration” of Zelaya, leaving the decision in the hands of the legislature controlled by the National Party and Liberal Party (the twin parties who run the country in tandem), in exchange for stripping all his powers and for a guarantee that the “international community” would recognize the phony elections which the de facto government plans to hold on November 29. 7. While the bulk of the resistance forces have given their support to the San José-Tegucigalpa Accord as a bitter necessity, some left groups reject this ignominious pact and speak of the “betrayal” of Zelaya. However, Zelaya, as a bourgeois politician, always proclaimed his desire for a “dialogue” with the murderers who until recently were his party colleagues. Already in his appearance before the United Nations in early July he agreed to return with reduced powers and gave up the demand for a constituent assembly. 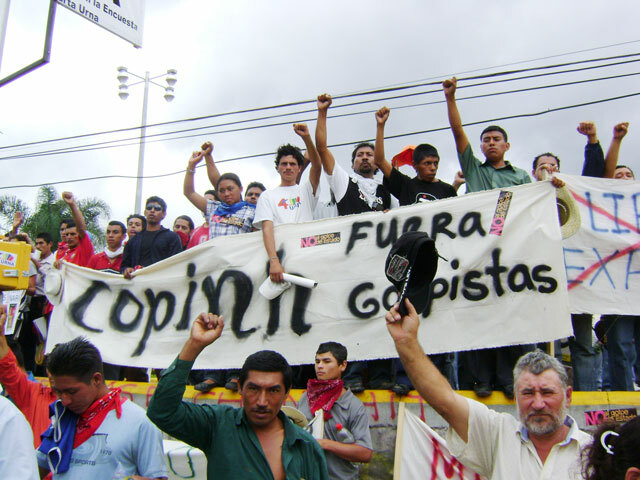 The fact is that the leaders of the popular front resistance fed illusions in Zelaya, with slogans such as “Mel, our friend, the people are with you.” To claim to fight for a constituent assembly and at the same time declare that the ill-fated Accord is a victory, rather than opposing this straitjacket, is spreading confusion among the masses and thereby assuming joint responsibility for a terrible defeat. 8. The League for the Fourth International, which from the very first day has called to defeat the civilian-military coup, fighting alongside the Zelaya supporters who resisted it, has insisted that the workers must be mobilized on an independent, class-struggle basis. We did not join in the deceptive popular-front chant, “the people united, will never be defeated,” when the experience of the Chilean Unidad Popular which coined this slogan shows exactly the opposite. Nor did we proclaim reinstatement of the bourgeois president as the goal. We emphasized that a revolutionary constituent assembly could only be the result of a successful insurrection that establishes a regime based on workers and peasants councils. At the same time, we fight for such a workers and peasants government to expropriate the capitalist ruling class and extend the revolution to a Central American federation of workers republics. In accordance with this Bolshevik policy, we denounce this Accord which would codify a victory of the coup-makers. 9. It would also formalize Honduras’ status as a semi-colony of the United States, with the Accord and the elections to be supervised by a Verification Commission headed by the Obama administration’s Secretary of Labor, Hilda Solis, and by Chile’s former president, Ricardo Lagos, an unconditional supporter of the U.S. From the outset, we warned against any appeals for U.S. intervention, demanding “Yankee Imperialism, Hands Off!” However, the bourgeois and reformist supporters of Zelaya, and the ousted president himself, insistently solicited Washington’s support. Venezuelan president Hugo Chávez begged, “Obama, do something.” In the U.S., the International Action Center issued a petition on September 23 calling on the Obama administration to “insist that the military regime ... restore President Zelaya to office,” and urged calls to the White House and State Department to “demand an end to ... the Micheletti fraud government.” Such dangerous calls on the imperialists – the godfathers of the coup! – requesting their intervention in the name of democracy, led to the fatal October 30 Accord. 10. Whether or not to participate in elections is often a tactical question for revolutionaries. We have always stressed that the ritual of going to the polls every so many years to cast a ballot with the illusion that one is choosing which of the competing bourgeois politicians will head the capitalist state – whose soldiers and police, courts, prisons and congresses constitute a whole apparatus to repress the exploited and oppressed – does not constitute the rule of “the people” (demos). If we run candidates or give critical support to others, we do so to expose the fraud of bourgeois elections and in full awareness that we are fighting on enemy territory, which is hardly neutral. If there is no candidate that represents a class opposition to capitalism, we may call for abstention. But in the present case, the rigged elections of November 29 are nothing but a farce which cannot express the massive resistance of the Honduran masses and will only serve to put a pretty face on what at bottom is a bonapartist (police/military) dictatorship. 11. The popular-front resistance to the coup ties the working masses to minority sectors of the bourgeoisie, in particular the Liberals in Resistance (whose red-white-red banners are quite visible in the demonstrations), the Democratic Unification Party (UD), sectors of the Innovation and Unity Party (PINU), and above all President Manuel Zelaya himself. UD is the product of a fusion of several groups with roots in the armed struggles of the 1980s, and in this respect is similar (although on a far smaller scale) to the Salvadoran FMLN and the Nicaraguan FSLN, former guerrilla groups that have transformed themselves into bourgeois electoral parties. In addition, there is a slate headed by Carlos H. Reyes, president of the bottling plant workers union STIBYS, which although formally independent has been politically allied with the Zelaya supporters. The alliance with these parties and candidacies serves to limit the actions of the working masses in the resistance to the framework of bourgeois politics. Trotskyists, in contrast, fight to break with the bourgeois popular front and to form a revolutionary workers party. 12. Concretely at this time it is necessary to unmask the electoral farce of the coup regime. The parties and electoral slates linked to the FNGCE have adopted an equivocal position as to their possible participation in the elections, limiting themselves to declarations that they will not run if the constitutional president is not reinstated. Given the foot-dragging policies of Micheletti & Co., it is possible that they will be forced to withdraw, even under the dictatorship’s threat of four to six years in jail for any candidates who pull out. In any case, even if they continue to run, revolutionaries and all class-conscious workers should oppose this dictatorial plebiscite. To the extent possible, it would be appropriate to call for an active boycott to prevent the electoral farce; or if conditions prevent this, to cast a blank or spoiled ballot. 13. Whatever is the outcome of the current frantic maneuvers over the San José-Tegucigalpa Accord, it is urgently necessary to intensify the struggle to mobilize the working class. A general strike in this country with a combative labor movement would be the most powerful weapon against a coup regime based on the employer class. But this would have to go hand in hand in hand with preparations for worker and peasant defense guards. Internationally, the struggle for active union support continues to be a priority, including calls for labor boycotts of Honduran cargos by transport workers unions. 12. The paramount task, particularly outside Honduras, is defense of the resistance fighters against the deadly repression. Honduras today is under a state of siege, as it has been since June 29. The death squads have been reactivated. They have even used sports stadiums as jails, recalling the Pinochet coup in Chile on that fateful 11 September 1973. At least a dozen Honduran trade-unionists have been murdered, above all teachers; resistance leaders like Carlos Reyes have been injured while others have received death threats. Even before the coup there were assassination attempts against leaders of unions and mass organizations. In April 2008, Rosa Altagracia Fuentes, general secretary of the Honduran workers Federation (CTH), one of the three union federations in the country, was murdered. It is necessary to organize a class-struggle defense of the thousands of detainees and to provide material support to the workers organizations in struggle. For workers mobilization to defeat the first coup of the Obama administration, and to head off the others which are already being plotted!